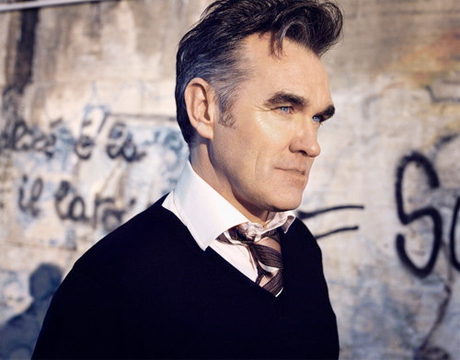 Morrissey Says New Album Is Becoming "Less and Less Likely"
Morrissey doesn't appear to be calming down in his middle age, as the notoriously press-baiting former Smiths vocalist still knows how to piss everyone off with controversy-causing comments. His latest statement, however, is of a decidedly more self-deprecating variety, as he has claimed that his lack of a record deal will likely mean that he may never release a new album. In a public letter posted on the fan site True to You [via Slicing Up Eyeballs, the singer wrote, "I now no longer expect to live long enough to experience an offer to record for a grownup label. This topic would not sound quite so banal had I not mentioned it 47 times already. I promise I will not mention it again. The world, I expect, will somehow endure, even as the follow-up to Years of Refusal grows less and less likely. End of subject. I promise." He's debuted new songs live, so his pessimism about releasing a new material evidently isn't because his output it dwindling. In a previous True to You letter, he even hinted that a new album was completed but without a label to release it. The latest message also details some of the highlights and low points of his recent U.S.-Mexico tour. He wrote, "I am anchored, delighted, and pale with gratitude. The reception in Mexico was beyond words. No attempt to describe could do justice." Meanwhile, Morrissey is preparing to go to court in his libel case against British music publication NME. He accused the paper of "rewriting the answers to my last NME interview in 2007 in order to make me sound racist." Morrissey wrapped up the letter by complaining, "Oh England, oh England -- is this all you have to offer?" Morrissey, we hope you never change.